Carly’s mom, Carly, and me, after her performance: VERY PROUD of her! 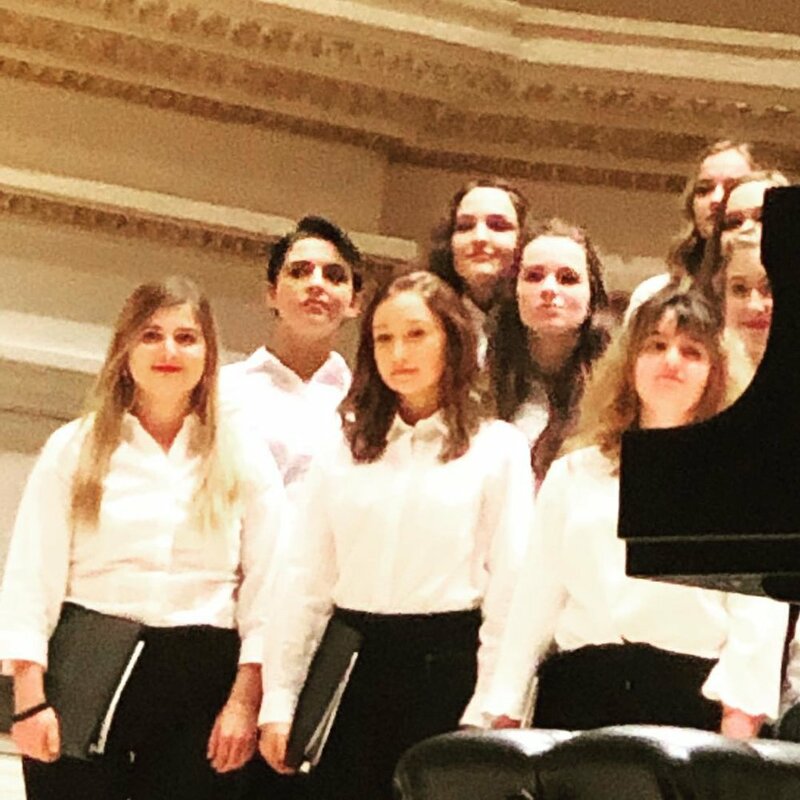 Last weekend, our family was extremely blessed to get to have our older daughter perform with the Honors Performance Series choir at Carnegie Hall in New York City! It was an incredible experience, a truly once-in-a-lifetime opportunity, and we’re so grateful to everyone who helped make it possible. From people who donated funds to people who gave us traveling tips to those who prayed for us, we give a loud and hearty THANK YOU to you all! 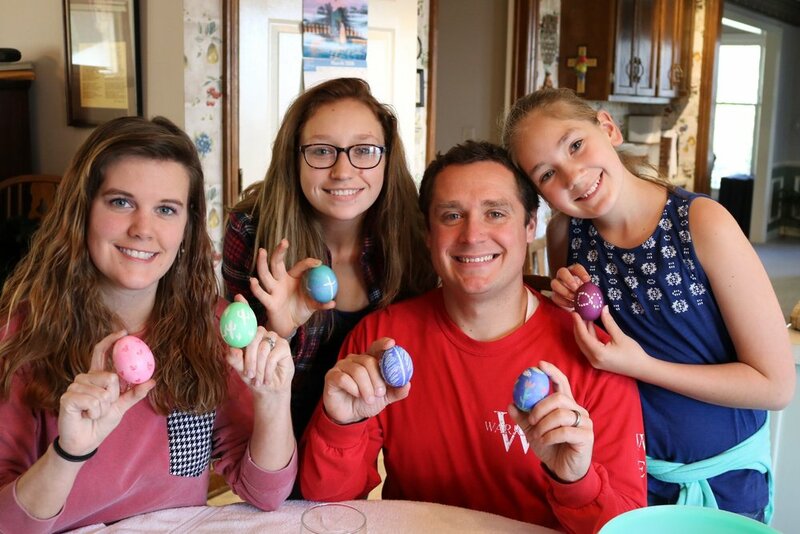 In addition to having such an amazing trip, I was reminded of a few important aspects to blended family life that I wanted to share. Carly and her friends celebrating after their performance. LOVE how well she makes friends and how much fun they had together. Co-parenting requires extra communication and patience when it’s on the road. Carly and her mom went to New York City a few days earlier than I did because Carly had rehearsals for the performance. The events of the program were all over the city and included rehearsals, tours, tourist events, celebrations, and the actual performance. Parents were only allowed at certain events, and were not allowed at others, and Carly’s mom and I took turns being at some of the parent events. Most importantly, in order to make sure Carly was where she needed to be, there had to be near-constant communication between Carly, her mom, and me. I’m very thankful to say this worked out quite well for Carly and for us, thanks to a healthy dose of communication and patience with each other. Put the kids’ needs first, and act like adults toward each other. By the time I joined Carly and her mom, they already had a pretty good routine and schedule worked out, and they were gracious in terms of letting me then join and become a part of it. The whole purpose of the trip was Carly’s performance, so the rehearsals were the number one priority. Outside of those though, Carly’s mom and I had a different set of priorities for our free time (i.e., we wanted to see different things in NYC). So, what did we do? We checked with each other to make sure that between the two of us we knew where/when Carly needed to be, and then we were able to still do the things we wanted as well. As before, this required understanding and communication, and I’m grateful that we were able to do all the things we wanted to and, most importantly, get Carly to where she needed to be. Celebrate the victories. Carly’s choir and the whole event were amazing. The kids were incredibly talented, the directors were top-notch, and the entire program was well-run. The most incredible thing was seeing our daughter on-stage performing at a world-famous venue and then getting to celebrate with her afterward. She made new friends, had an exciting and exhausting (in a good way) time, and it’s something she will remember forever. So, how did we celebrate? By being there with her and encouraging her and telling her how insanely proud of her we are. We took pictures and posted them all over social media, and we tagged each other to make sure no one missed any of the pictures. We spoke with family and friends, and we made sure that Carly knew she was the centerpiece of this event and celebration. And it was spectacular. Bonus: Show gratitude to everyone who makes great family moments possible, especially the spouses and other family who weren’t able to make it. Truth be told, we would have loved to have taken our entire blended family to New York( mom and stepdad, dad and stepmom, and the other children), but it just wasn’t financially or logistically possible due to cost and work schedules and life. So, what to do? The answer is to make sure we express our gratitude to everyone for their contributions. I know Carly was great about sending thank you letters to donors who helped pay for the trip, and I knew we did the same as well. But I also want to extend a special thank you to the girls’ stepparents for being understanding, for being trusting, and for taking care of the other children (and our pups!) while we were in New York City. I know they would have loved to have seen Carly’s performance first-hand, and Carly knows it too. Yet, though it wasn’t possible, their support wasn’t any less than ours. THANK YOU for that, and I pray that I can be that supportive in the future. Action step: This week, ask yourself how you can support your spouse and the other branch of your blended family, whether through prayer or through offering to help with logistics or scheduling. Show patience and understanding, and be sure to celebrate the victories. Do you remember being a teenager and getting into an argument with someone that you already didn’t like very much? Words got louder, the exchange got more and more heated, and as a result you both ended up saying angry and hurtful things. Sometimes the exchange may have gone even farther and resulted in a physical confrontation. Now, imagine that same scenario between two ex-spouses (without the physical altercation at the end): hurt feelings, loud voices, angry words, hurtful tones, and ultimately nothing getting accomplished or solved. Unfortunately, this situation is all too common in blended family situations. So, what’s the solution? Well, as with most things, the solution is to be found in Scripture. Proverbs 15:1 tells us that, “A soft answer turns away wrath, but a harsh word stirs up anger.” Many of us have heard those words in our past, though perhaps we never fully realized how powerful they actually are. The solution to de-escalating a tense and anger-filled situation is often as simple as answering quietly and in humility. The volume, tone, and voice we use often send a more powerful message than the actual words we say. And when we remember that, we are more likely to get things accomplished. When heading into a potentially difficult conversation within a blended family, it’s important to be clear on a few things ahead of time: 1) What is the purpose/goal of the conversation? Whatever that is, stick to it and keep the conversation relevant to that topic. 2) Genuinely seek out the best solution, even if it’s not the one that you have proposed. Do your best to keep your ego out of the equation. 3) Remember that the only person you can control is yourself. Do that, even if the other person chooses not to. Why are these so important to remember? Well, consider the alternative: the conversation gets heated, the original purpose gets lots, more hurtful words are said, and you end up worse of than before and without having solved anything. Instead, consciously choose to remain calm and respectful. “Well, you don’t know what they did!” or “You don’t know what they said!”, someone might say to me. You’re correct! I don’t know what your ex did or said, but I do know that you can still choose to be in control of your emotions and your response. How do I know? Because I have learned, through failure before success, from experience and observation, that it is possible to keep your temper and ego in check regardless of what else is being said to or about you. I’ll be the first to admit (as I did just a moment ago) that I have also failed. But the principle remains true, even in our failure: “A soft answer turns away wrath.” When I have been able to remember that, the results have always been better. I’ve never once had a good conversation that involved heated words and loud voices. However, I have seen situations where a soft answer has helped calm things down and keep them on track. Is it easy? Certainly not! Is it worth it? Absolutely. Action Step: This week, whenever you’re faced with a tough situation, pray for calm, for patience, and for the humility to be respectful even when it’s difficult. You won’t get it right every time, but when you do you’ll see that the results are much better.